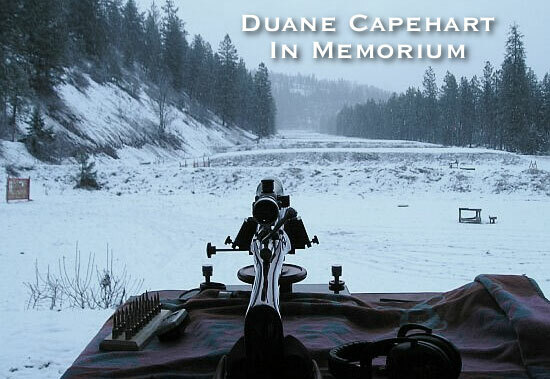 We are sad to announce the passing of Duane Capehart, a leading figure in the long-range shooting community. Duane passed away in early June, and is survived by his wife Pat. 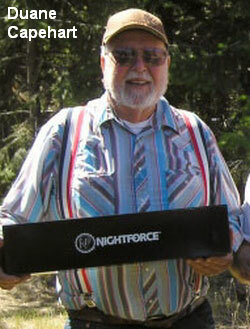 Duane was one of the game-changing Montana marksmen who smashed records at the Missoula Deep Creek range. Duane Capehart was a truly great Hall of Fame shooter and a noble man. I am grateful for the wisdom he shared with me. He was a great fellow shooter at the range, that he helped build, especially on those frosty mornings. He never hesitated to help a new shooter. He was a good friend and neighbor here in the Bitterroot. He will be long remembered. My condolences, Pat. — Greg R.
I had the honor and privilege to shoot against and converse with Duane on three occasions, and also by phone[.] Duane was funny, witty, sincere, and a friend to everyone. He was one of the best 1000-yard shooters in the business. My heart and prayers go out to Pat, and all his family. — Donovan M.
I met Duane just four years ago. He welcomed me at Deep Creek and he and I spent many a morning before the shoots visiting about shooting, hunting, work and everything in between. People there always seemed to look up to Duane, and once you got to know him you understood why. I will never forget some of the shoots with him, he was an amazing shooter, several times while pulling his targets he would not even be on target with his sighters. But then the record target would go up and he would pull off a 98 or a 99, or even a 100. This did not just happen once either — Duane [was] simply an amazing guy! I helped him and Pat hook up their camper at the end of the August final shoot last year, shook his hand goodbye and he said “I will see ya in the spring young man”. Well that didn’t happen but I will always remember Duane and always be grateful that he was my friend. Happy shooting in Heaven Duane, and God Bless you Pat. — Wayne B.
Duane took this photo at the Deep Creek Range in March a few years back during one of his “Dawn Patrol” missions. Temperature? Duane said it was about 17 degrees! Now that’s dedication. Duane truly loved the shooting sports. He will be missed. Share the post "Duane Capehart, Noted 1000-Yard Shooter, Has Left the Range"
In just two weeks, the 2013 NRA National Rifle and Pistol Championships commence at Camp Perry, Ohio. The big event kicks off with the Pistol SAFS on July 7th. There’s still time to register online for the National Championships. To sign up, visit www.NMEntry.com. In response to increased interest in F-Class shooting, event organizers have even added a new discipline this year, the Mid-Range Rifle Championship with shooting at 300, 500, and 600 yards. (We wonder what chamberings F-Open competitors will choose for this new event — could this be the year of the Dasher at Perry?) 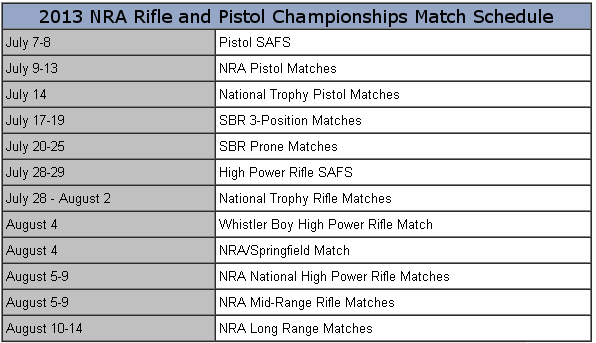 For 2013, F-Class competitors can enter the NRA Mid-Range Rifle Championship and/or NRA Long Range Championship. 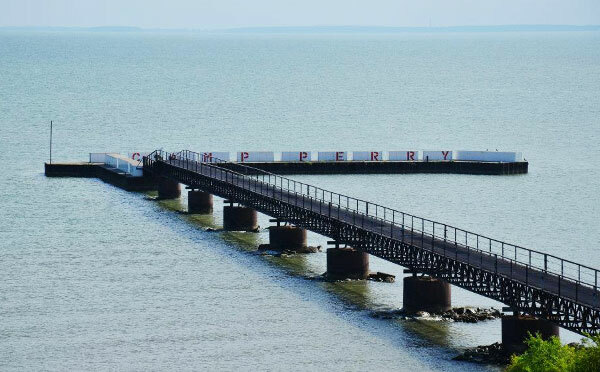 We know many of our worldwide readers may never have a chance to visit Camp Perry in person, but they are still interested in this historic facility on the shore of Lake Erie, near Port Clinton, Ohio. 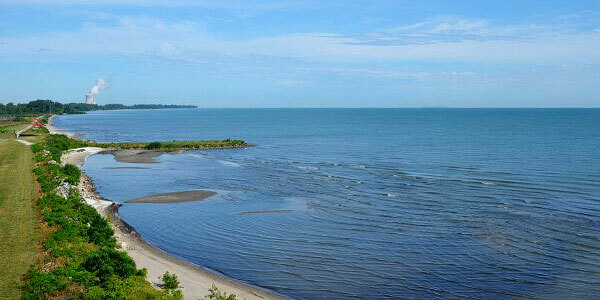 If you’ve always wanted to see what Camp Perry looks like, here are a series of “Birds-eye” photos taken from the Beach Tower. Photos Courtesy Civilian Marksmanship Program. Share the post "NRA National Rifle and Pistol Championships Commence Soon"
Gov. Rick Perry of Texas and Gov. Dennis Daugaard of South Dakota visited Connecticut last week. The two Governors hoped to recruit manufacturers to re-locate operations to their more business-friendly states. Connecticut firearms makers are high on the list of businesses both Perry and Daugaard seek to bring to their respective states. Gov. Perry wants Connecticut gunmakers to relocate to the Lone Star State, while Gov. Daugaard hopes South Dakota can attract these enterprises. The economic report card for the State of Connecticut is in and the results are not good. The Bureau of Economic Analysis reports that Connecticut was last in the nation in economic growth in 2012, the only state where the combined value of goods and services produced (GDP) was lower than in 2011. In fact, total state GDP fell a quarter of a billion dollars last year, the same amount it fell in 2011. On the heels of that report, the Manufacturing Alliance of Connecticut released the results of a survey that revealed Connecticut manufacturers predict a bleak outlook for the state’s economy and the health of their industries. The survey reported that a majority of the state’s manufacturers have been recruited to expand or relocate to another state and that they would consider doing so, most citing “government attitude” as the reason. Connecticut’s firearms and components manufacturers have been the rare exception to the state’s dismal economic performance in recent years. Colt, Mossberg, Stag Arms, Ammunition Storage Components, to name four such companies, have added hundreds of jobs in recent years and, as a result, have contributed more in local and state taxes, even as other industries have cut back and moved facilities and jobs out of state. Share the post "Texas and S. Dakota Governors Go East to Recruit Gun Makers"